My students love anchor charts. 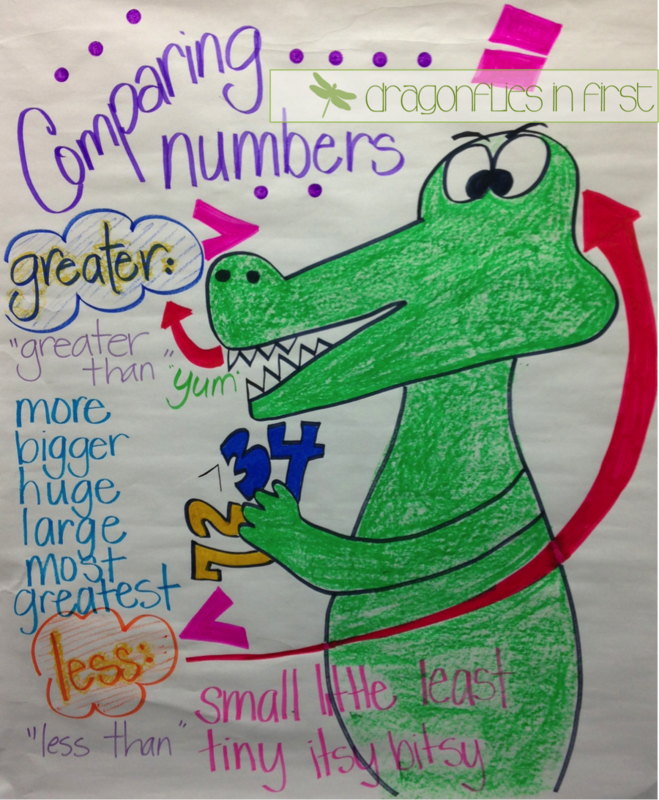 With the most recent math standard we worked on, I flipped the whole anchor chart concept. Instead of using the chart to anchor the new ideas being introduced… I had my kids dictate to me what I should put on the anchor chart AFTER we had been working on the concept for a week. All that schema spilling out with excitement… It was fab! So… the alligator leaves a lot to be desired and the words are a little wonky but the kiddos love that THEY designed it and it’s all about what they learned. And while those little smarties were telling me all that needed to be on that poster, the ones whose comparing numbers schema wasn’t quite fully formed yet, had a chance to work on it and cement those skills a little more. Win-win. Anyway… it’s a fun way to assess the kids and allow those who aren’t quite “there” yet another opportunity to practice. The poster will be up in the room for a while so we can continue to refer to it as we spiral review and it will give the last stragglers a constant visual on the concept. 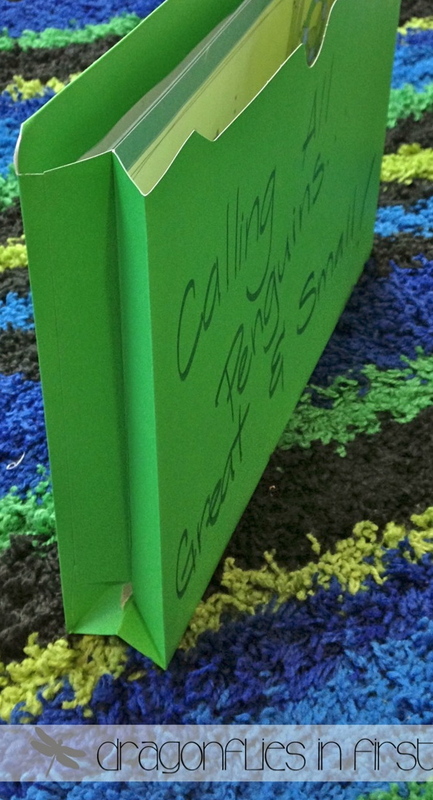 In working on the comparing numbers skill, my kids used the “Calling All Numbers Big and Small” file folder game from the Winter Math Games pack. I had to reprint and laminate this game this year because I used the school’s laminator last year. It was, after all, BPL (Before Personal Laminator). 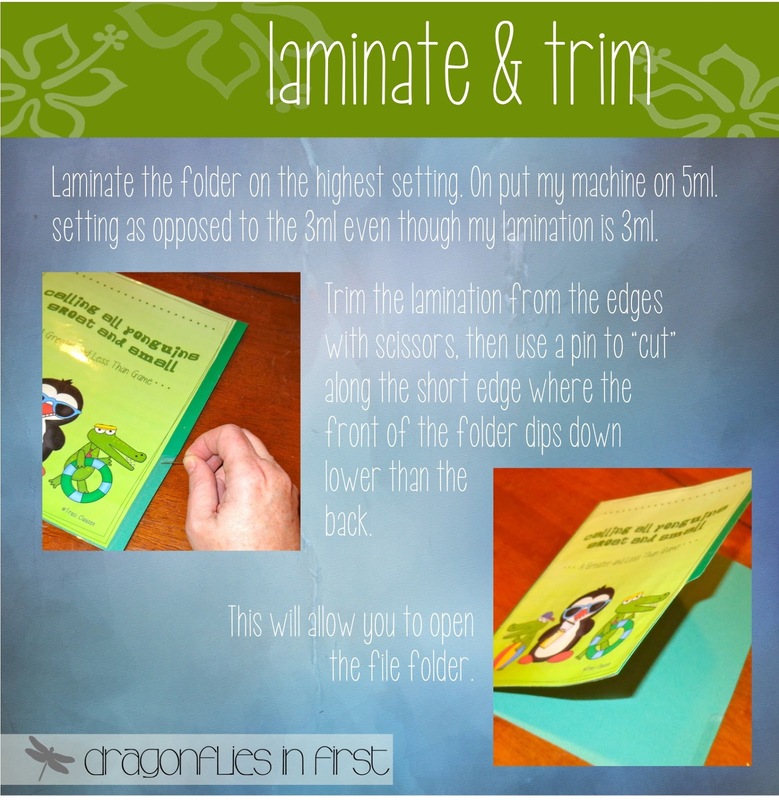 I LOVE LOVE LOVE my little Scotch laminator. It laminates WAY better than the one at school. The lamination is so nice and thick. Everything holds up better and looks better. I didn’t really mind reprinting and laminating the comparison game. 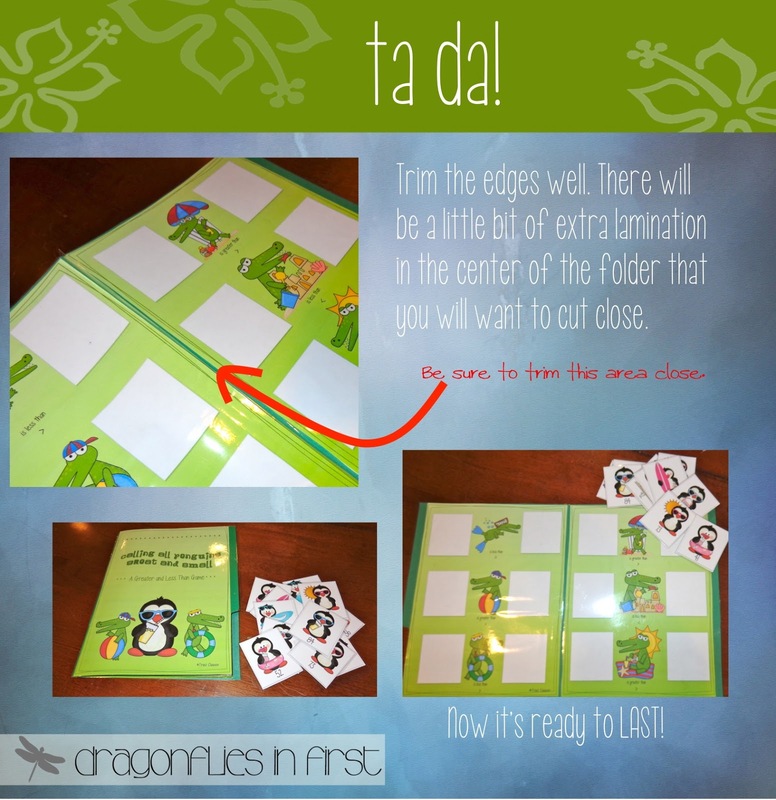 I even laminated the FOLDER at home! The only thing I was concerned about when I purchased it was that I wouldn’t be able to laminate larger things. But after figuring out a way to laminate file folders – I am happier than ever with my little purchase. This is what I did. 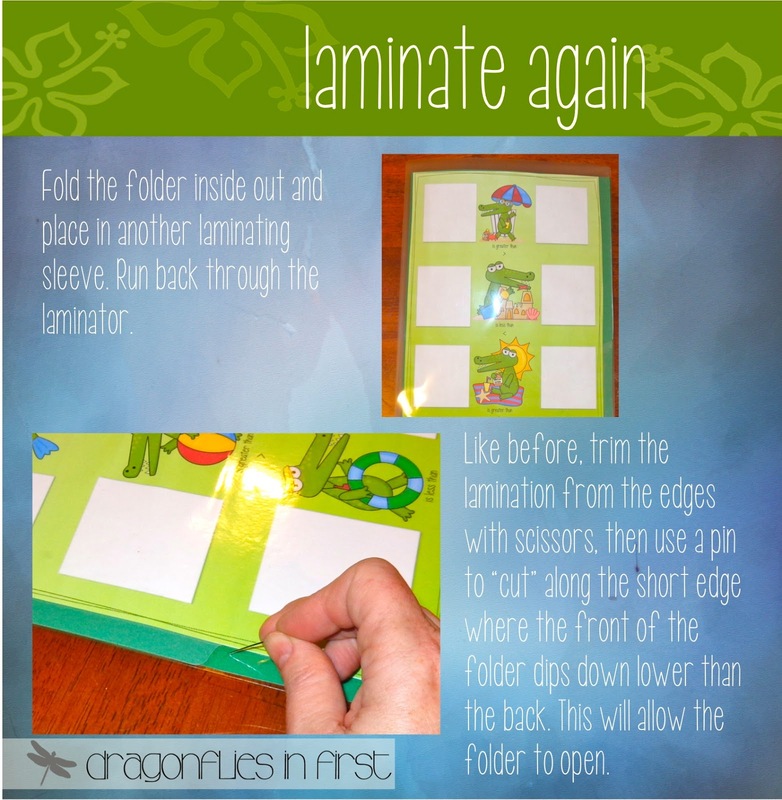 I don’t know if it will work with all personal laminators, but I had absolutely NO problems with mine. I store all of my games in these file folder jackets. They are great because I can color code them, they hold a LOT of stuff including game pieces, dice, paper and file folders – everything I need for my games. They expand… or not. They stand up. 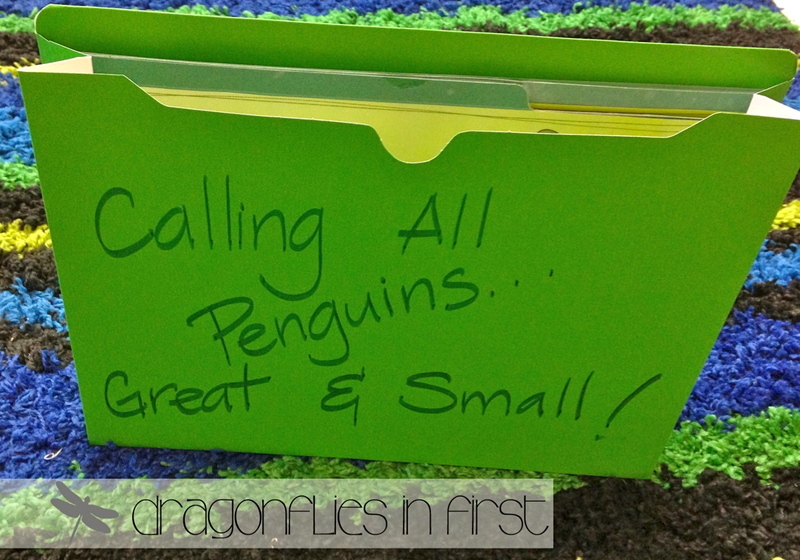 All of these things make them great for storage as well as setting them out for the kiddos. No ripping paper envelopes, no torn or broken zippers of zip-style plastic bags. They’re great. 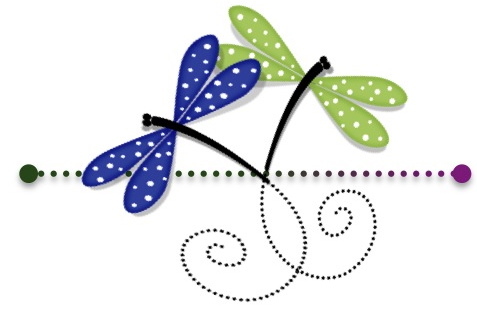 Don’t forget to enter the contest to win an iPad Mini, Kindle Fire HD, or Nook HD from Teacher’s Notebook. We can enter daily until January 31st for a chance to win. I just purchased the very same laminator. 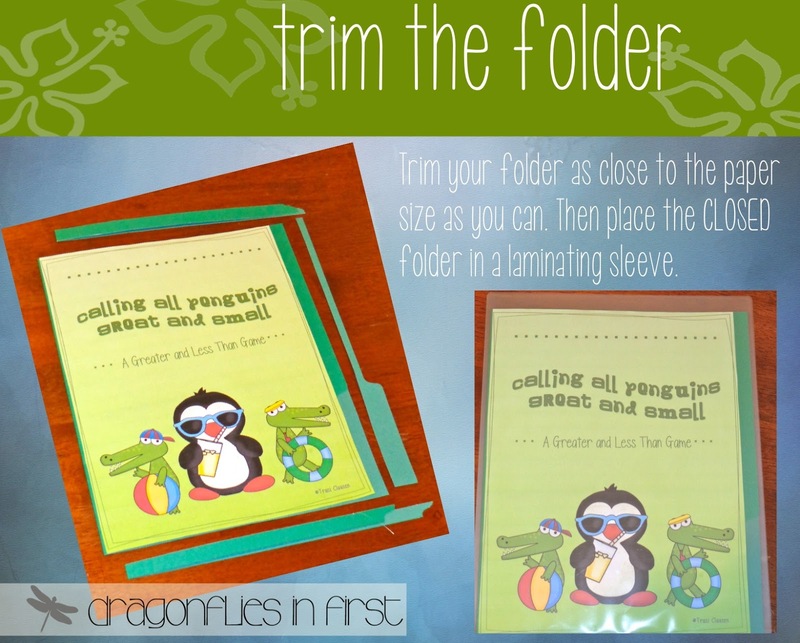 Haven't made file folder games in ages. Perhaps, your tips will inspire to to try using them again. Your anchor chart is awesome. I haven't been inspired to use them until I saw the way you flipped it around. I like that! I wish I had more room to use anchor charts-we aren't allowed to hang anything on the walls or from the ceiling. Boo! I think it is a really effective tool though. I stick mine on my cupboards! Since they are just big post-its, I can move them around a lot. I put them on my white board when we are going over/using them, then move them to a cupboard for the kids to refer to as needed. 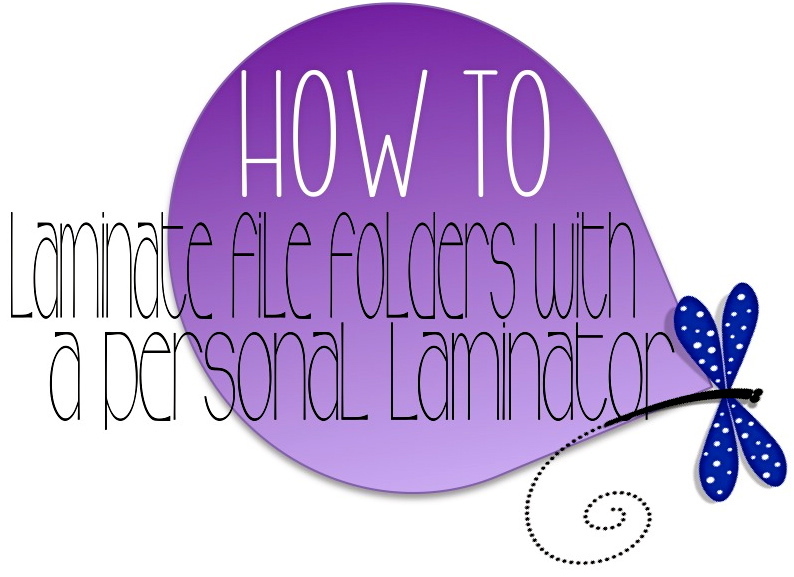 You're so right about everybody needing a personal laminator–I have one and use it all the time! 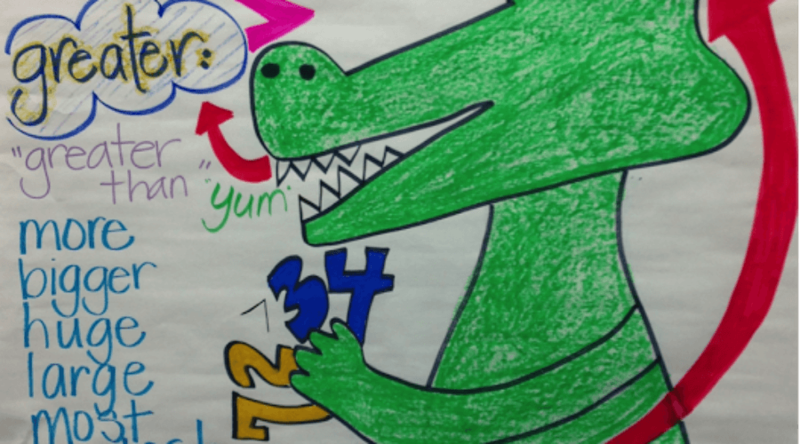 Love your anchor chart artwork, too! I love the flip anchor chart…first of all it's darling! Secondly and more importantly how great for your kiddos to dictate to you and give you all that knowledge they learned…HOW fun. I will certainly try that very soon. We have so much coming up with Polar Regions,etc. I can't wait. Thanks for sharing my friend.